Hematopoietic stem cell and immune cell transplantation has cont- ued as a promising therapeutic alternative and a fascinating area of cell biology as well as a field of persistent procedural problems. This - plains why substantial parts of basic research on cell growth and d- ferentiation, immune tolerance and antitumor effects, gene transfer, minimal residual disease and supportive care have settled around cli- cal transplantation in hematology and oncology. 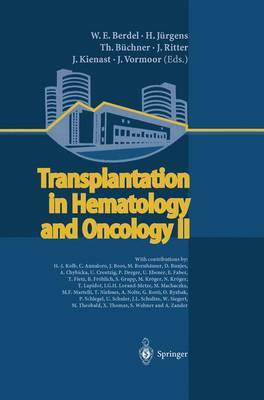 This second volume again updates the current role of allogeneic and autologous transpl- tation in leukemias, lymphomas and solid cancers, including cont- versial strategies and novel experimental approaches. In particular, cellular immune therapy, new conditioning strategies, mismatched donor transplantation, updated clinical transplantation, antiangiogenesis and strategies against fungal infections are focused upon. Outstanding representatives of leading groups guarantee fir- hand information and indicate how we can work and cooperate more effectively to the benefit of our patients. The editors are indebted to the Gesellschaft zur Bekampfung der Krebskrankheiten Nordrhein-Westfalen for a substantial support of the publication. They also acknowledge the major contribution of Beate Kosel as coordinator of the editorial work.